Hire: SIR-1000i and SCX-32i units available for hire. The Sony SIR-1000 Series (SIR-1000 / SIR-1000i and SIR-1000W) are high-speed digital data recorders which apply Sony's latest AIT recording technology to meet the ever-advancing needs of measurement applications. SIR-1000i is capable of recording 20kHz for 16 or 32 channels and expanding the channels up to 128 per recorder. SIR-1000W is a wide band recorder for data of 4 channel-160kHz, 8 channel-80kHz, or 16 channel-40kHz. 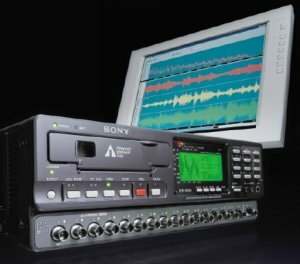 All the Sony SIR-1000 Series recorders are equipped with independent AD/DA converters with 16-bit linear quantization and 64 time oversampling digital filters for each channel. Together with the SCSI-2 high-speed data transfer, these features allow the recorder to be used as a high performance front end. Data recorded on the SIR-1000 Series can be played back on an AIT streamer drive.This makes the recorder a very user and computer-friendly data collection system. Do you have data archives on AIT media that requires backing up or extracting, or worse still corrupted media that will not load? If so, we are able to help. Using a purpose built stand-alone system with built in AIT1 drive and Sony Precision's software, we are able to extract all valid data from your tapes and transfer this data onto USB / SDHC drives for small quantities or hard disk for larger archives. Data format is typically in Sony's standard binary format for analog data. Which can be read using Data analysis packages such as Flexpro. In the worse case of the tape being corrupted, normally by the EOD (End of data) marker not being written correctly by the SIR-1000, it may be possible to recover data using special Sony software to detect and manually write the EOD, therefore enabling data extraction prior to this point. Please contact us for a quotation if this service is of interest to you.